One of the biggest problems with the Internet of Things sheer number of incompatible ecosystems. A developer can create a solution for a particular ecosystems, but doing so limits the potential market. Multiple ecosystems can be supported, but complicates development and expands the code footprint. The Open Connectivity Foundation (OCF) set out to solve this problem by designing a RESTful, crowd-sourced, data-model-based system designed for interoperability from the start. Additionally, OCF sponsors a certification process and a certified open-source implementation (IoTivity) with code for several platforms. Over 350 companies are members of OCF. As chair of the tools task group in OCF, I will explain the architecture and development process using OCF, IoTivity and the available tools. While the development process is technical, the talk will emphasize the business benefits of developing products that work with OCF. 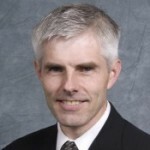 Clarke is the Principal Architect of emerging technologies at Shaw Communications. Currently, he’s focused on the Internet of Things. Before that, Clarke spent 11 years at CableLabs analyzing and developing technologies for the cable industry. He is a public speaker on the Internet of Things and an active technical contributor to the Open Connectivity Foundation (OCF). He has occasionally been a judge for the CES Innovation Awards. Clarke was on the board of directors of Universal Plug-n-Play Forum (UPnP), chaired the Technical Committee, and led the Internet of Things task force until UPnP was acquired by OCF. He has also chaired various task forces related to video and television in the World Wide Web Consortium (W3C). He has developed key technologies for the delivery of IP video and other cable services through the web. In general, Clarke relishes developing connected services as they cross traditional product boundaries. Prior to Shaw, Clarke worked in engineering, research, product management and strategy around digital media and communications at CableLabs, MediaOne, SonicBlue and Qwest. He built the world’s largest subwoofer and holds over twenty issued patents (and dozens not yet issued). In his spare time, he designs and builds home recording studios, theaters and other custom home improvements. He holds MSEE degrees from Brigham Young University and Georgia Tech and an MBA from the University of Colorado.